TORONTO (Mar. 27) — Something is wrong. Whether it’s resulting from a late–season slump or a factor more ominous, Frederik Andersen has lost his way between the pipes for the Toronto Maple Leafs. That, alone, is hardly unfamiliar. Andersen’s performance tailed off noticeably in the final six weeks of last season. But, the explanation has to be different this time around. As we’ve documented in this corner, the Leafs No. 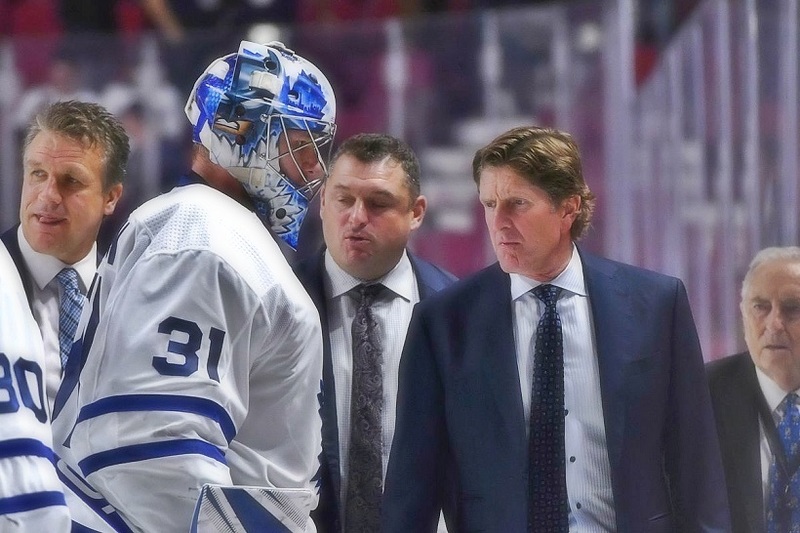 1 goalie succumbed to fatigue last spring — a malaise detected by everyone other than Mike Babcock, who kept riding Andersen mercilessly in the final days of the regular schedule. It was less-than a surprise that the big Dane fell apart in Game 7 of the opening–round playoff series against the Bruins, allowing a seven–spot at TD Garden. Weariness, however, cannot be the overriding factor this year. Andersen played only four times in a 5½–week span between Dec. 22 and Jan. 31. 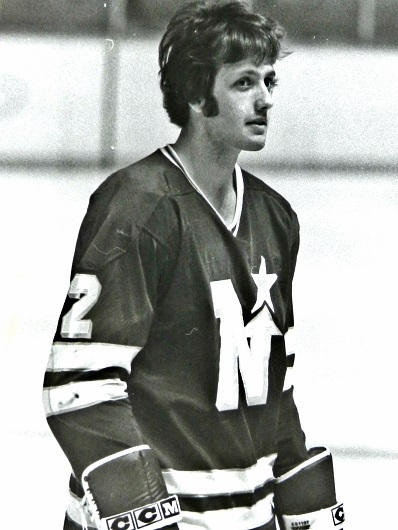 Under no circumstance would Babcock have provided his starting stopper such downtime had a groin–pull not intervened. And, even though Andersen returned on schedule, it is reasonable to wonder if the injury has nagged him through the second half. For a goalie — given the acrobatics required to play the position — a groin ailment can impel much stress. It is quite–easily aggravated and never fully dissipates without prolonged inactivity. Could Andersen still be in the throes of discomfort with the playoffs merely two weeks away? What could be more crystal–clear than all of that (sigh)? So, again, we are left to wonder if the groin injury has contributed to Andersen’s abominable statistics since the Feb. 25 National Hockey League trade deadline: a .897 save–percentage and 3.45 goals–against average. As mentioned here numerous times, the Leafs — Andersen most of all — have sorely missed puck–moving defensemen Jake Gardiner and Travis Dermott. Since Mar. 6, the club is a middling 4–4–3 in 11 games, having yielded 45 goals (4.09 per match) while losing to such–inferior opponents as Vancouver, the Rangers, Chicago, Ottawa and Philadelphia. Andersen has not been nearly as sharp and reliable as during the first 60 games, when he contended for the Vezina Trophy. It is a major concern at this late juncture of the season. Goalies, like position players, can descend into a slump and re–emerge without warning. If Andersen falls into this category, he’ll potentially come around by the Apr. 11 playoff opener. If the groin injury has prevailed, the Leafs will be one–and–done by the Bruins yet again. With a Pentax camera and telephoto lens, I was bitten by the photo bug in my late–teens – a juncture that coincided with season tickets I had for hockey games at Maple Leaf Gardens. There was no–such thing as digital photography back then; pictures had to be processed into negative–image strips and then “developed” – optimally in a professional lab. More often than not, you would take a roll of film to your local drug store; drop it off, and pick up your photos a week later. The industry has come a long way since the late–70’s. Such hobby geeks as myself would commandeer their parents’ laundry room; replace the standard light–bulb with a dull yellow version (thereby avoiding exposure that would negate the development mechanism); transmit negative images onto special photographic paper with an optical “enlarger” and then bring their snapshots to life with trays of chemicals. It was a complicated, yet enjoyable process that hooked me for the better part of three years. FROM MY SEASON–TICKET LOCATION IN SEC. 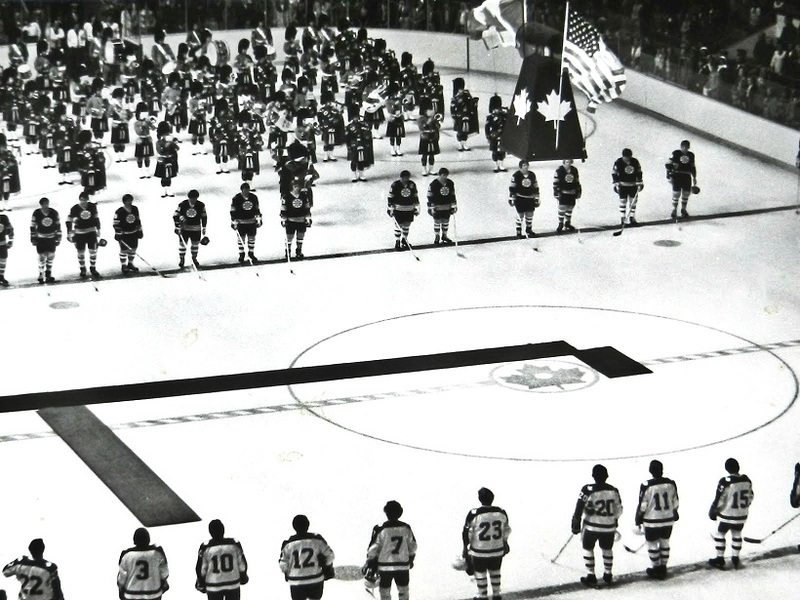 30, ROW F OF THE SOUTH–MEZZANINE BLUES AT MAPLE LEAF GARDENS, THE LEAFS AND BOSTON BRUINS STAND FOR THE NATIONAL ANTHEM PRIOR TO HOME OPENER OF THE 1976–77 SCHEDULE (SAT. OCT. 9). AS IS STILL CUSTOM, THE SEASON WAS USHERED IN BY THE 48th HIGHLANDERS. LEAF PLAYERS (FROM LEFT–TO–RIGHT) ARE DAVE (TIGER) WILLIAMS (22), BOB NEELY (3), GEORGE FERGUSON (10), ERROL THOMPSON (12), LANNY McDONALD (7), RANDY CARLYLE (23), CLAIRE ALEXANDER (20), INGE HAMMARSTROM (11) AND PAT BOUTETTE (15). THE ’76–77 MAPLE LEAFS WERE COACHED BY LEONARD (RED) KELLY; THE BRUINS BY DON CHERRY. 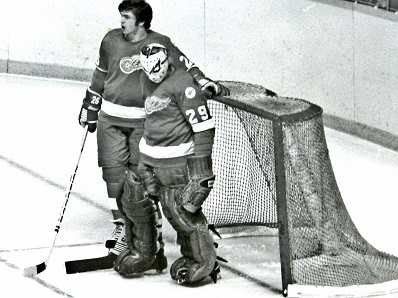 MAPLE LEAFS CAPTAIN DARRYL SITTLER (LEFT) AND MONTREAL GOALIE KEN DRYDEN. ANOTHER VIEW FROM MY SEASON TICKETS IN THE SOUTH MEZZANINE BALCONY AT MAPLE LEAF GARDENS. 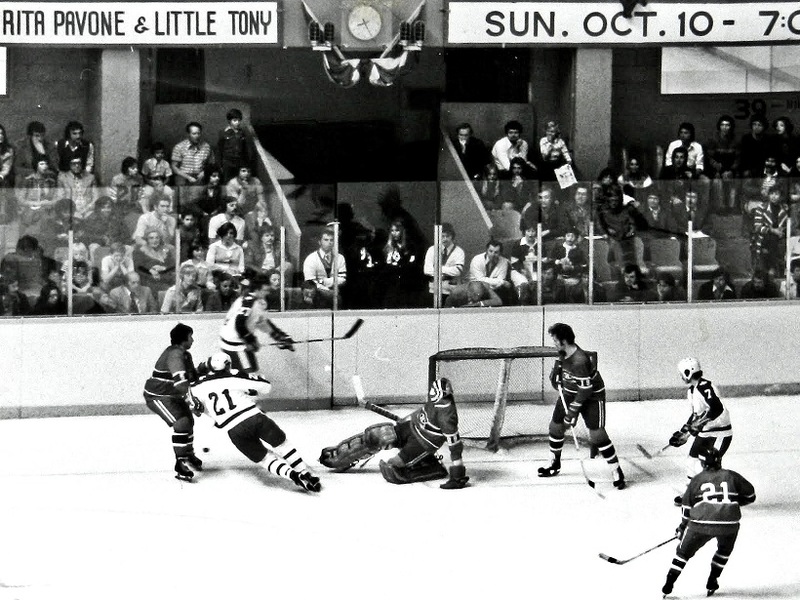 KEN DRYDEN OF MONTREAL KICKS OUT A SHOT, AS LEAF PLAYERS BORJE SALMING (21), DARRYL SITTLER (BEHIND NET) AND LANNY McDONALD (7) BUZZ AROUND. 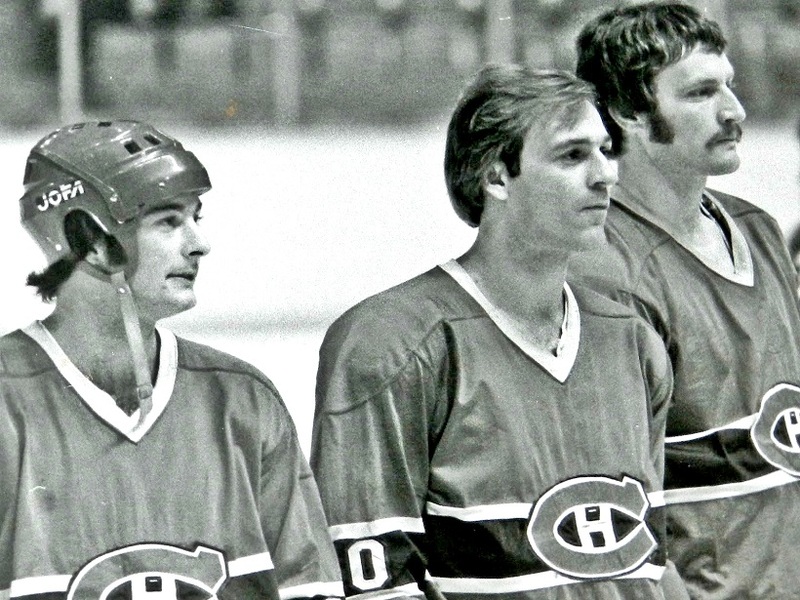 HABS (LEFT–TO–RIGHT) ARE GUY LAPOINTE, DRYDEN, LARRY ROBINSON AND DOUG JARVIS (21). 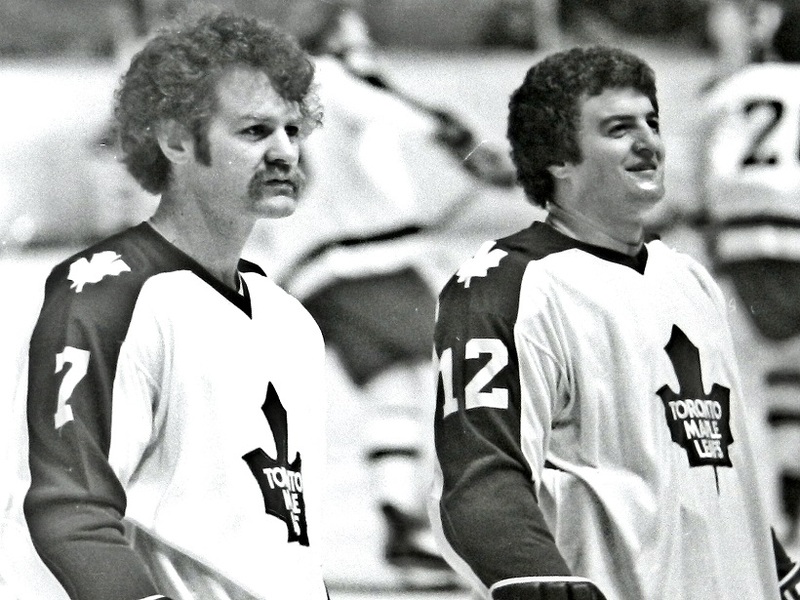 LANNY McDONALD (LEFT) AND ERROL THOMPSON FLANKED DARRYL SITTLER ON A PROLIFIC FORWARD LINE — AMONG THE BEST IN LEAFS HISTORY. 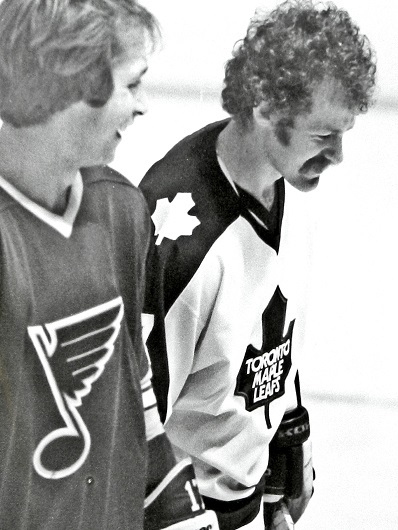 McDONALD AND THOMPSON COMBINED TO SCORE 80 GOALS IN 1975–76 WHILE SITTLER BECAME THE FIRST LEAF TO ACCRUE 100 POINTS. 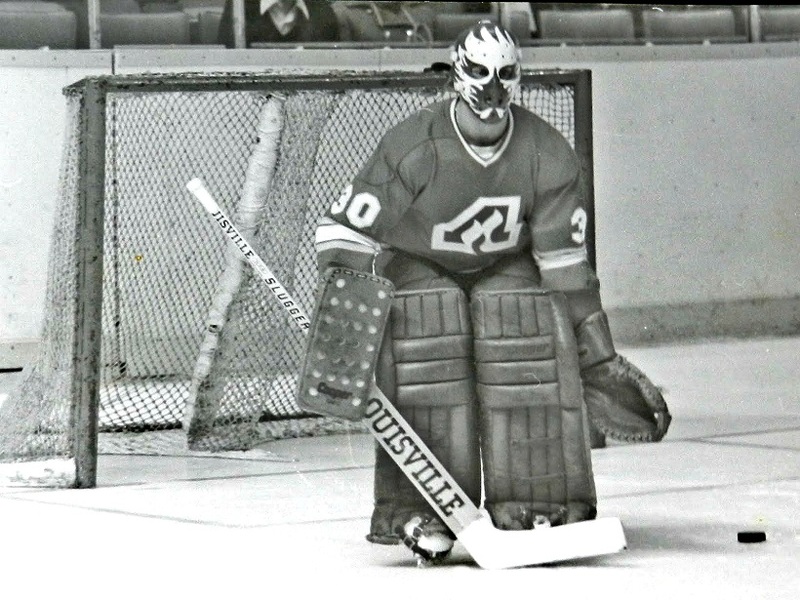 FORMER NHL TEAMS: GOALIE DAN BOUCHARD (ABOVE) OF THE ATLANTA FLAMES (1972–79); DEFENSEMAN BRAD MAXWELL (BOTTOM–LEFT) OF THE MINNESOTA NORTH STARS (1967–93); CENTER DENNIS MARUK (BOTTOM–RIGHT) OF THE CLEVELAND BARONS (1976–78). 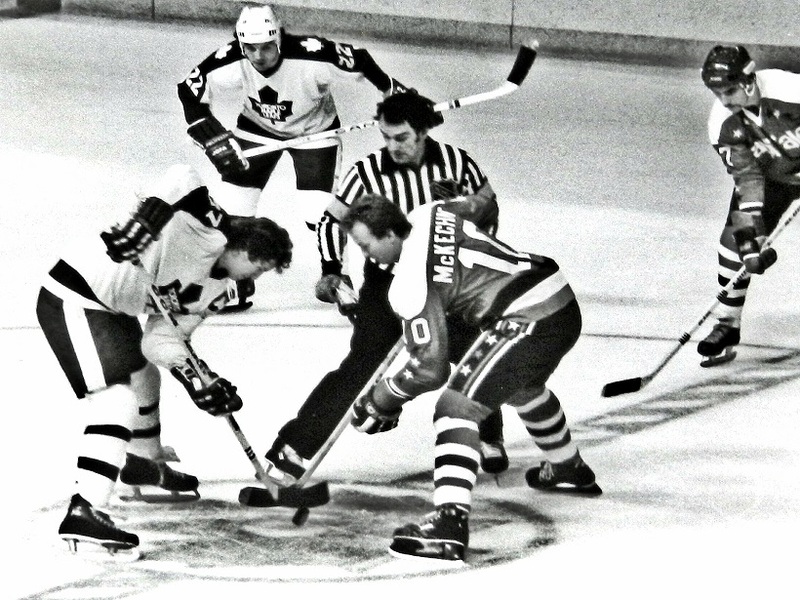 REFEREE BRYAN LEWIS DROPS THE PUCK AT CENTER ICE (NOV. 16, 1977) BETWEEN DARRYL SITTLER OF THE LEAFS AND WALT McKECHNIE OF THE WASHINGTON CAPITALS. 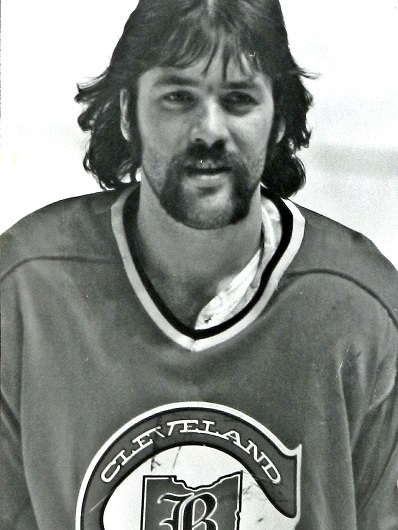 TIGER WILLIAMS (22) IS THE OTHER TORONTO PLAYER. 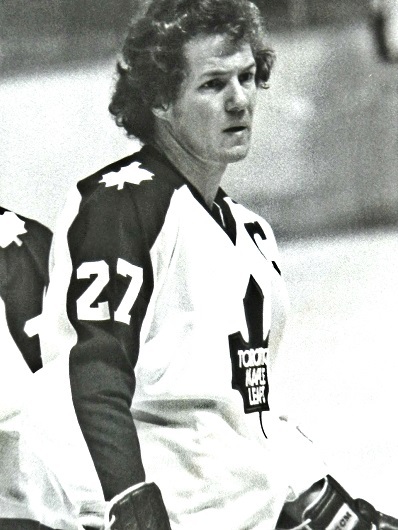 SITTLER AND McKECHNIE WERE JUNIOR TEAMMATES IN LONDON AND WOULD BECOME NHL TEAMMATES THE FOLLOWING YEAR (1978–79) WHEN McKECHNIE JOINED THE LEAFS. 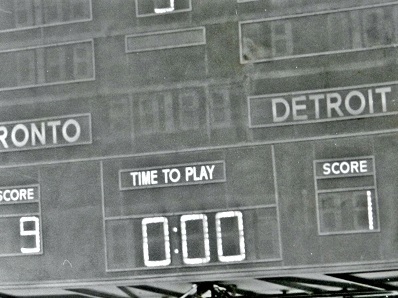 TURNBULL’S RECORD NIGHT: I TOOK THESE PHOTOS ON FEB. 2, 1977 (TORONTO vs. DETROIT). 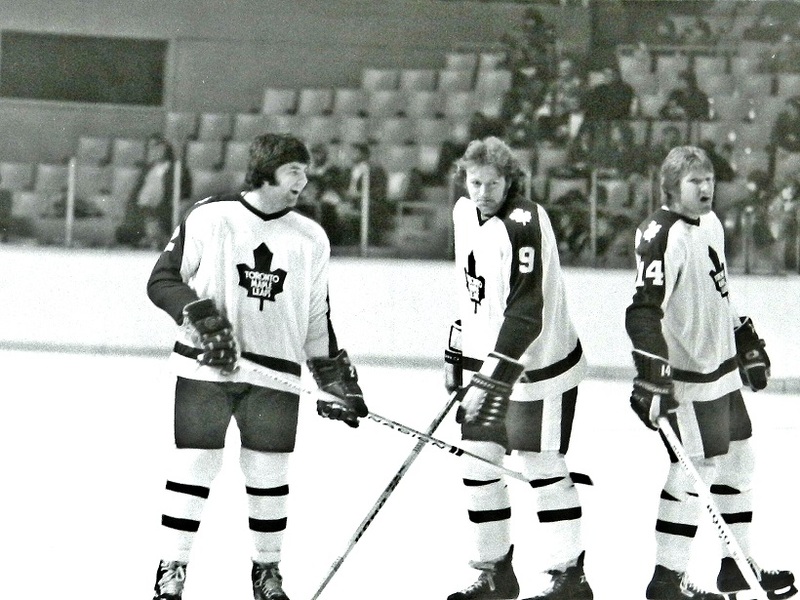 LITTLE DID IAN TURNBULL (TOP–LEFT) KNOW — WHILE JOKING IN WARM–UP WITH TEAMMATES DON ASHBY (9) AND STAN WEIR (14) — THAT HE WOULD SCORE FIVE GOALS TO ESTABLISH A SINGLE–GAME RECORD FOR DEFENSEMEN THAT STILL EXISTS MORE THAN 42 YEARS LATER. AMONG TURNBULL’S VICTIMS WAS VETERAN GOALIE ED GIACOMIN (29, BOTTOM–LEFT). AND, YES, THE LEAFS ROMPED. 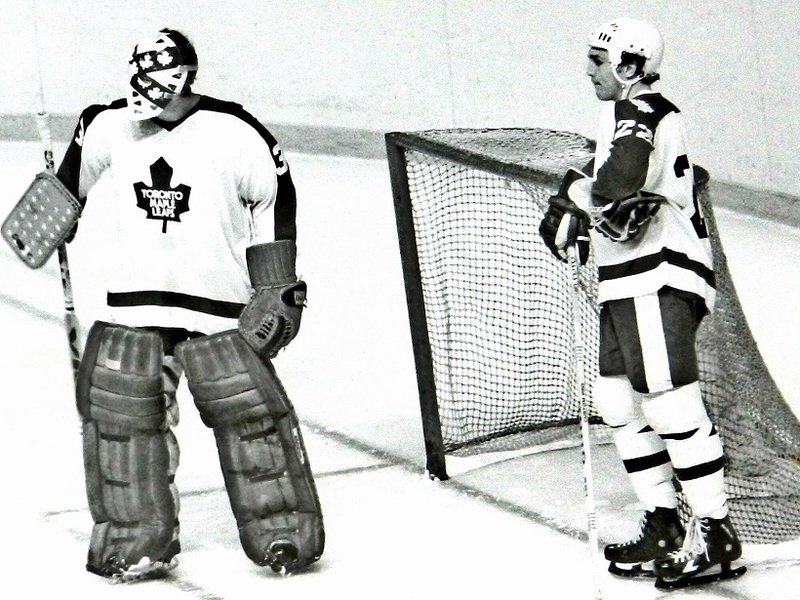 A RITUAL BEFORE THE OPENING FACE–OFF (AND AFTER THE NATIONAL ANTHEM) IN EVERY LEAFS GAME WAS TIGER WILLIAMS LEANING ON THE TORONTO NET – HERE, BESIDE GOALIE WAYNE THOMAS. 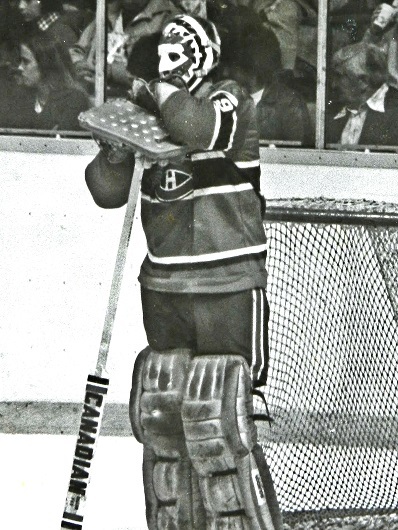 PHOTOS IN THIS BLOG WERE SNAPPED DURING THE MONTREAL DYNASTY OF THE LATE–70’s: SCOTTY BOWMAN’S TEAM WINNING FOUR CONSECUTIVE STANLEY CUPS (1976–77–78–79). THREE HABS, ALL NOW IN THE HALL OF FAME, ARE PICTURED HERE, POSING FOR AN ICE–LEVEL TV CAMERA DURING THE PRE–GAME WARM-UP: LEFT–TO–RIGHT STEVE SHUTT, GUY LAFLEUR AND LARRY ROBINSON. LANNY McDONALD CHATS (TOP–LEFT) IN THE WARM–UP AT MAPLE LEAF GARDENS (FEB. 8, 1978) WITH EX–TEAMMATE INGE HAMMARSTROM OF ST. LOUIS. 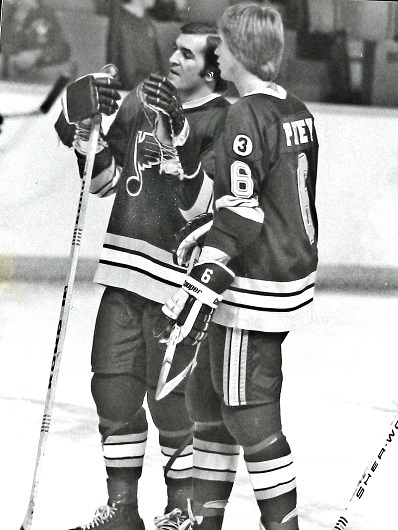 VETERAN BLUES’ DEFENSEMAN BOB PLAGER (TOP–RIGHT) DISCUSSES STRATEGY WITH FORWARD LARRY PATEY. 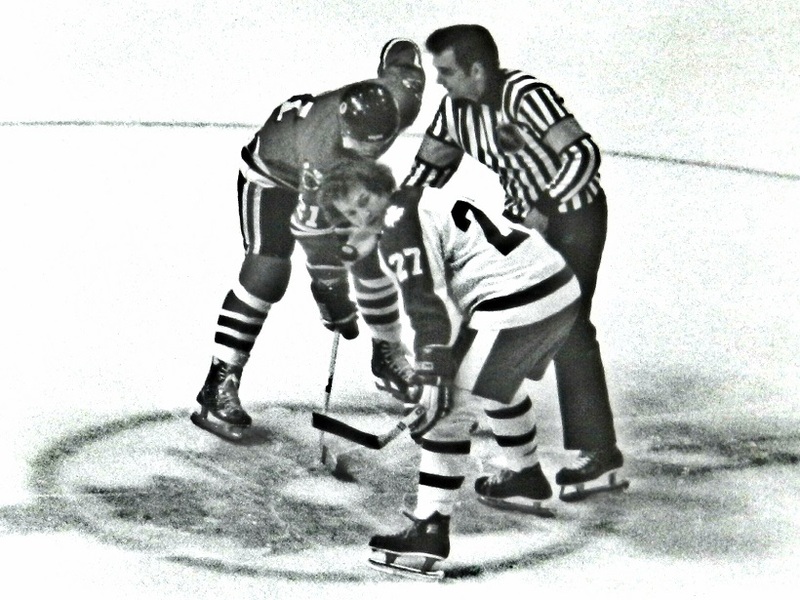 DARRYL SITTLER CHECKS BEHIND HIM BEFORE FACING OFF AGAINST THE LATE STAN MIKITA OF CHICAGO AT THE GARDENS. ANDY VAN HELLEMOND IS THE REFEREE. 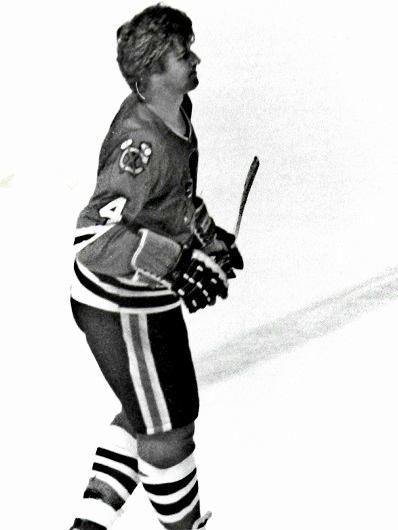 BOBBY ORR (LEFT) WITH THE CHICAGO BLACKHAWKS LATE IN HIS UNRIVALED NHL CAREER. 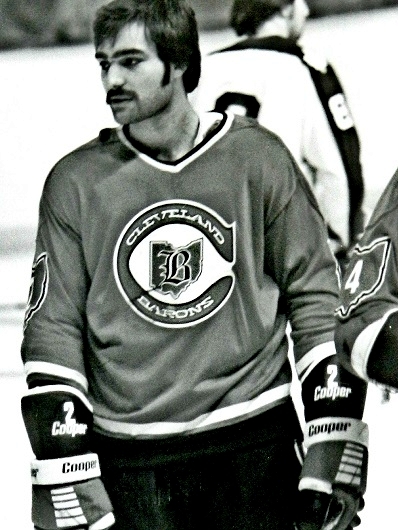 AND, CLEVELAND BARONS DEFENSEMAN RICK HAMPTON (TOP–RIGHT).